Old Town Lunenburg, founded in 1753, is the best remaining example of planned British colonial settlement in North America. It was developed as a model town, with a rigid grid and wooden houses. The town grew into an important seaport and shipbuilding centre. Lunenburg was named in honour of the King of Great Britain and Ireland, (George August of Hanover) who was also the ruler of Brunswick-Lunenburg. During the French and Indian War, several small forts which ringed the town were garrisoned by British regulars as well as by provincial troops from Massachusetts. These forts were erected to protect the town from raids by French warships and from attacks by the local Indians. This lovely town is exemplary of how good planning can create beauty. There are so many great old buildings that have been preserved in this fishing village. In 1753, the British founded Lunenburg as their first colonial outpost in Nova Scotia beyond Halifax. The first settlers arrived in June 1753. Mostly Protestant German, Swiss and French colonists, the settlers participated in a formal lottery, choosing cards to determine the plots of land upon which they would settle and build. The settlers soon discovered that the land was poorly suited to farming. European farmers, faced with rocks, stumps and stubborn soil, became rugged North Atlantic seafarers within two generations. 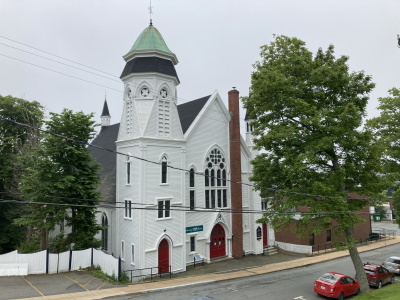 Through the nineteenth and well into the twentieth centuries, Lunenburg became famous for the quality of its schooners, which fishermen sailed to the fish-rich Grand Banks off Newfoundland and the Western Bank off Sable Island. The queen of the schooner era was the famous Bluenose, launched at Lunenburg in 1921, and it is still displayed prominently on the Canadian 10 cent coin! It is a pleasure to see the different styles and colours and a photographer’s wonderland. Many of the homes have little signs telling the name and job of its historical owners. This is a relaxing and easy site to do, with the hills giving a good chance for exercise, and good restaurants, shops and hotels in close proximity, making it a traveller’s delight. It was difficult to leave this area. Old Town Lunenburg is a fantastic representative of Atlantic Canadian fishing villages on the World Heritage Site list. Buildings in the town date back to the 1700s, when Britain established the village. 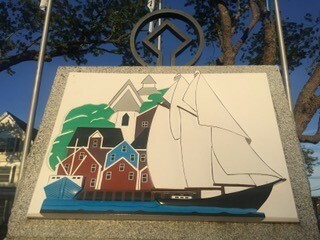 Lunenburg's fortunes were directly tied to its role in shipbuilding for the cod-rich fisheries of the Grand Banks, offshore from Nova Scotia and Newfoundland. Among the ships built in Lunenburg was one of the most famous racing schooners in Canada, the "Bluenose", immortalized on the Canadian dime. I visited the town of Lunenburg in summer 2006, and enjoyed walking past the shipyards and fish plants, as well as the brightly painted historic buildings. Lunenburg still serves as a fishing and shipbuilding town, and is known for building replicas of sailing ships. While in town, I went for a sail on the "Bluenose II", a replica of the famed schooner built in Lunenburg; the view of the harbor from offshore was extremely memorable. I really enjoyed my time in Lunenburg, and if the "Bluenose II" happens to be in town during a visit, I highly recommend going for a sail to gain a greater appreciation of the seafaring heritage of Lunenburg. Logistics: Old Town Lunenburg is about one hour south of Halifax, and can be visited by car or by private tour. 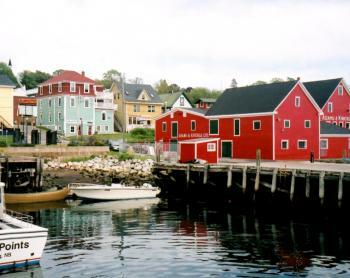 Lunenburg is a small town known as one of the most known tourist spots in Nova Scotia. It is famous from town planning, picturesque buildings and maritime connections. In fact, the inscribed centre is very small and you can easily walk through it within hour or two. The town is proud of its UNESCO inscription and informing plaques are visible in almost every corner. We visited maritime museum, which was very interesting, especially in terms of local tradition. The old buildings were really nice but I was disappointed with ugly old-fashioned electric lines that in my opinion destroyed the beauty of this place. I wish UNESCO asked the respective officials to hide it underground before inscription. Now, it is impossible to take a photo of Lunenburg's centre, on which those lines are not visible. We visited Lunenburg in June 2010. Beautiful weather, beautiful town. We stayed in a bed and breakfast overlooking the harbor. Lots of lovely old buildings and atmosphere, with lots of little shops. The town is very accessible to walking, although it is built on a bit of a hill. For the inside scoop on the town, with lots of details about the history of the buildings and houses, take the horse-drawn carriage ride from the wharf. We also visited the fisheries museum and learned a lot about whales and fishing there! I must say that I'm usually pleased with how Canadians take pride in their World Heritage Sites. Old Lunenburg is no exception. A lovely area in the old town (to the right of the town's bandstand) is dedicated to the site's inscription as a WHS, which includes the WHS plaque, the UN flag, and information about other WHS in Canada. A bonus is the playground next to this area. My kids played while I took pictures! Although hilly, it's easy to walk around the town. I saw many people mowing their lawns or just relaxing on the front porches. Enjoy looking at old homes with beautiful exterior colours! Dissappointing? No way! We happened to be there when the Blue Nose II came "home" for repairs- what a show! The whole town (locals and tourists) was on the dock waiting for her to arrive at dusk to cheering and applause! The locals are very proud of their schooner! And she is beautiful! Next day, we boarded for a tour- free of charge! The town of Lunenburg is beautiful, peaceful and gracious. Will definitely visit again! From "Lunenburg Old Town" to "Old Town Lunenburg"
Bureau - ICOMOS recommended awaiting a comparative study into colonial planned settlements. Some bureau members query value of these. Agreed to leave it to WHC! Ideal City: "The model town was an important aspect of imperial policy for the British, to provide the functional space thought necessary for the smooth working of a colony"
Protestantism: Home to the Oldest continuous worshipping Lutheran and Presbyterian Congregations in Canada, both having been founded in 1753.